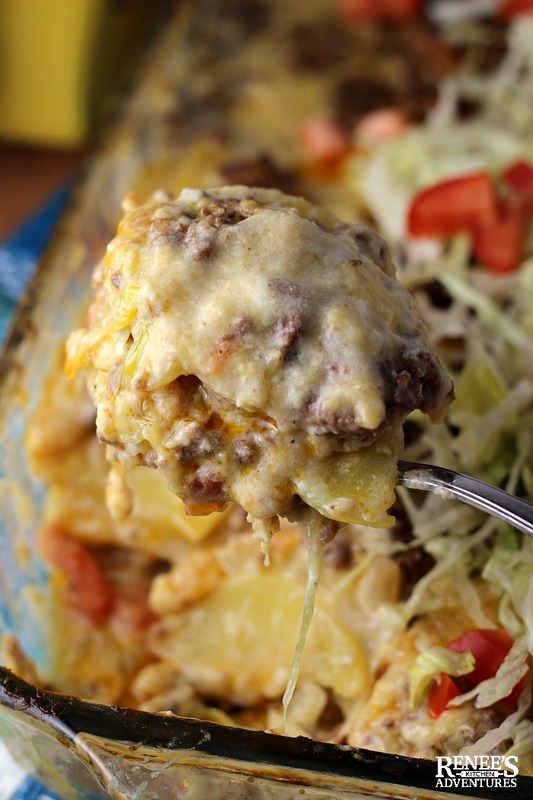 Say hello to this amazing Cheeseburger Casserole recipe! Full of all the good stuff you would expect in a cheeseburger but in a delicious hearty casserole. You'll find seasoned lean Certified Angus Beef ® ground beef, smokey bacon, and potatoes covered in a creamy, cheesy sauce and topped with crisp lettuce and vine-ripe tomatoes for a memorable meat and potatoes meal anytime you serve it! It's the stuff the Midwest fuels up on! Cheeseburger Casserole Recipe for the win! This delicious Cheeseburger Casserole with potatoes is just the ticket for a hearty meat and potatoes meal the whole family will love! 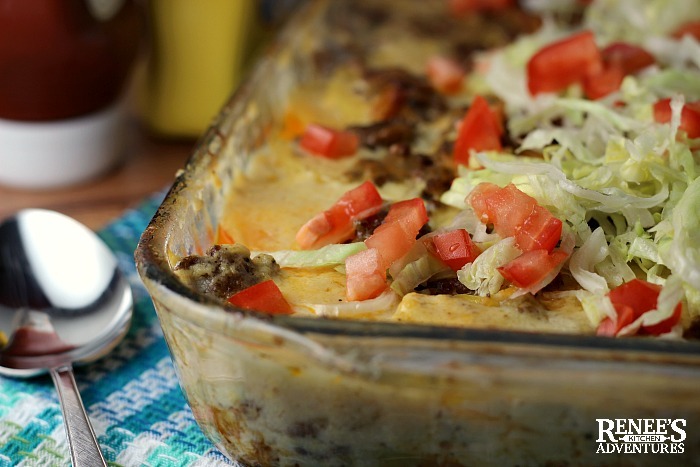 We loved this Cheeseburger Casserole recipe, and if you are a meat and potatoes fan, I know you will love it too! 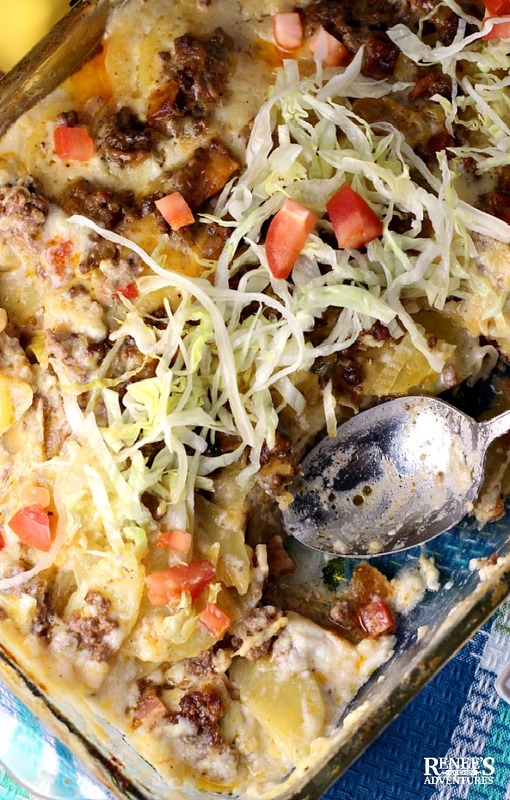 You'll want to make sure you choose the best Angus beef for this Cheeseburger Casserole recipe. I like to buy Certified Angus Beef ® brand because it really does make a difference! Certified Angus Beef ® brand began way back in 1978 with a group of ranchers who wanted a way to provide consistent quality beef to the consumer. They started what became the nation's first premium beef company, Certified Angus Beef ® brand. Certified Angus Beef ® brand doesn't raise their cattle on a corporate farm. They source the cattle used in their product from a network of family ranchers spread across the country. The beef they put their label on has to meet 10 exacting standards. It's these standards that truly make it the best Angus beef available! If you follow my blog, you know that I always choose Certified Angus Beef ® brand when it comes to making beef recipes like my Slow Cooker German Style Pot Roast and the Best BBQ Meatloaf. I am a firm believer that quality ingredients are everything when it comes to kitchen success! 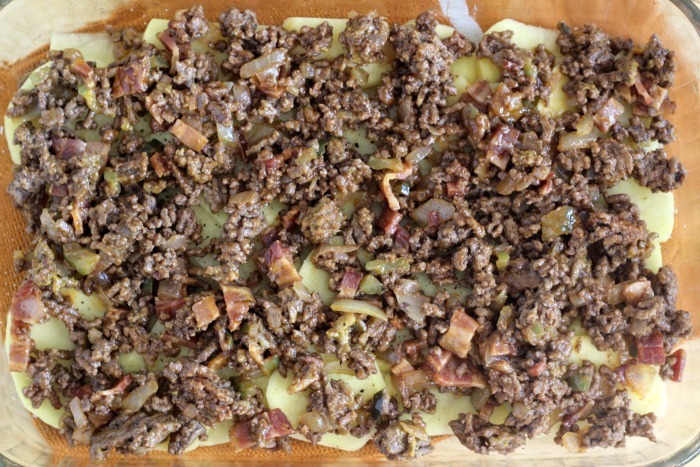 Think of this Cheeseburger Casserole recipe as sort of a "lasagna" type deal! It's a fairly easy cheeseburger casserole to assemble. But, like traditional lasagna, requires a bit of prep work. Potato slices are layered with seasoned lean Certified Angus Beef ® ground beef. 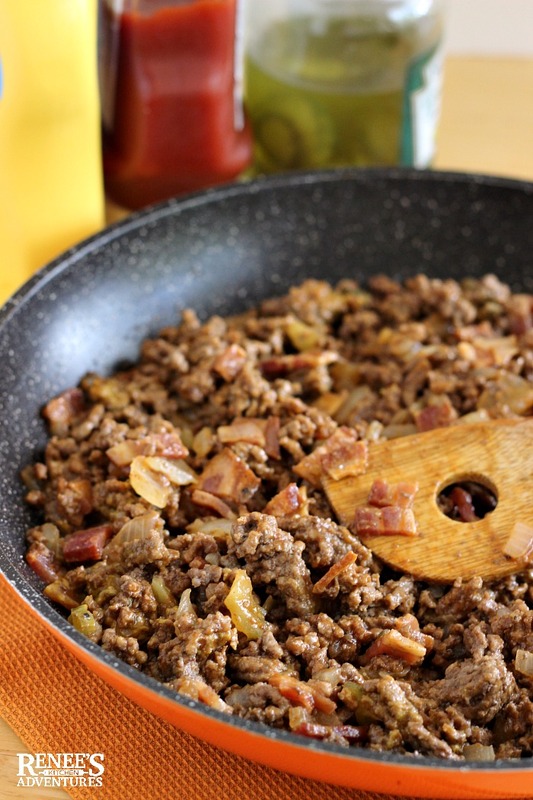 I like to go with the leaner beef for this dish, so you'll want to look for a package of ground beef that says 90% lean or higher. Once the potatoes, seasoned ground beef and bacon, and the cheese are layered in a baking dish, a creamy white sauce is poured over everything and the cheeseburger casserole recipe is baked in an oven until the potatoes are tender and everything is hot and bubbly. I topped my Cheeseburger Casserole recipe with some crisp iceberg lettuce and chopped vine-ripe tomatoes to finish it off! But it's totally up to you if you like to garnish or not! Once you get everything chopped and ready to go, assembling this Cheeseburger Casserole is pretty easy! I used a good old fashioned knife to slice the potatoes, but if you want to make things go quicker, you can use a mandolin or a food processor instead. You can also purchase pre-sliced potatoes from the store to save the work of peeling and slicing. I prefer using Yukon Gold potatoes for this recipe, but you can use any potato variety you like here. Russets would work well too! Next, you spread half the seasoned ground beef and bacon over the potato layer. Then repeat the layers and pour the flour/butter/milk (white sauce) over the whole thing and bake! 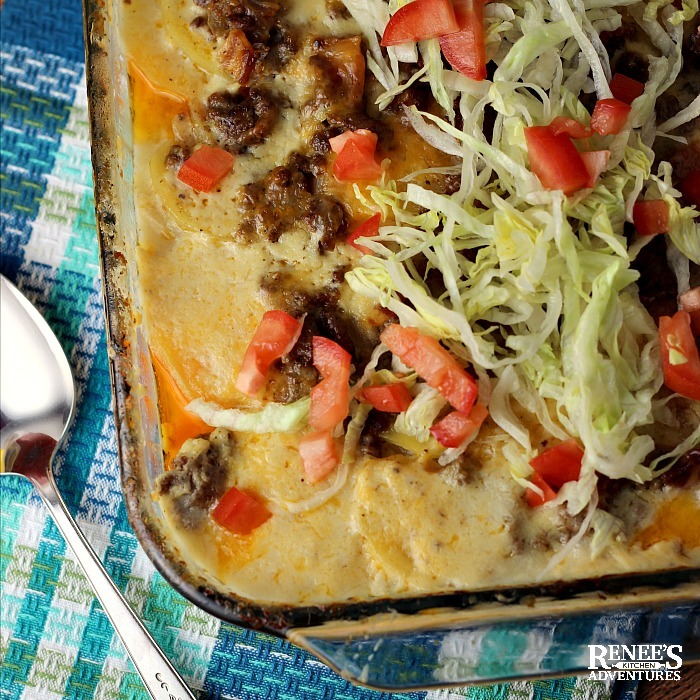 This Cheeseburger Casserole recipe makes about 12 good sized servings! With all the football tailgating parties upon us this time of year, this recipe would make a great addition to your menu! 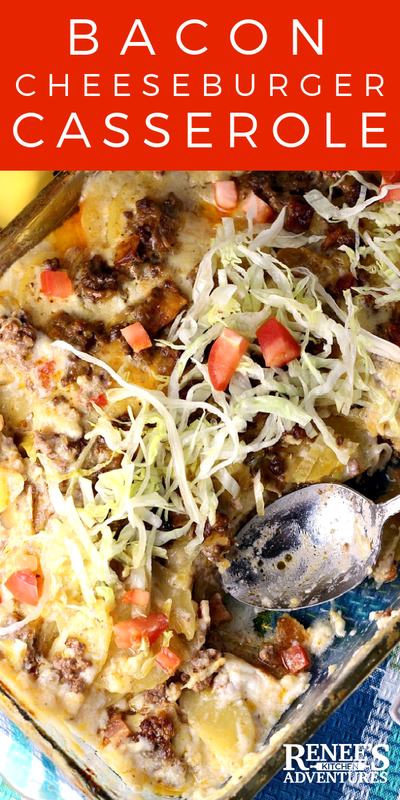 What's not to love about beef, bacon, cheese, and potatoes? 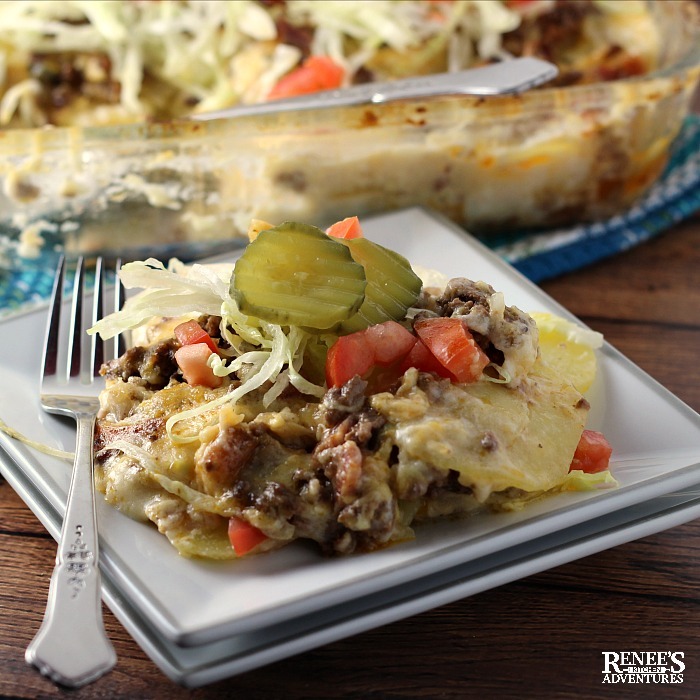 Seasoned ground beef is mixed with crisp bacon and layered lasagna-style with potatoes then covered in a creamy cheesy sauce for a stick-to-your-ribs meat and potato cheeseburger casserole recipe! 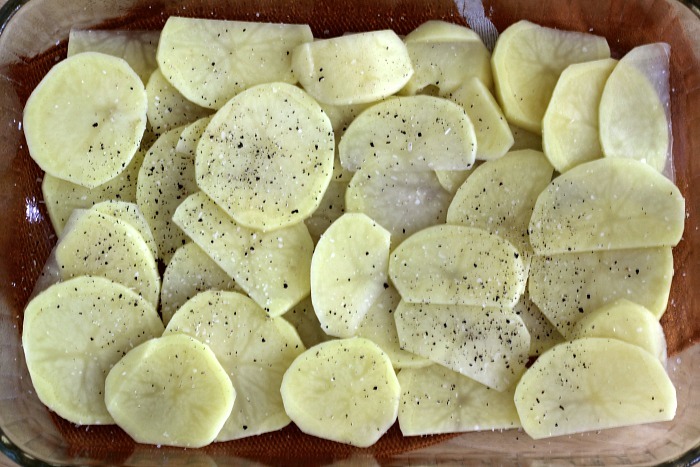 Peel and cut potatoes in 1/4" slices. Set in bowl with cold water to prevent from browning. Set aside. Pre-heat oven to 350 degrees F.
In large skillet, heated to med high, brown ground beef and cook onions until soft, breaking apart the ground beef as it cooks. Drain off any excess fat. Take off heat. To the skillet with the beef and onions, stir in ketchup, mustard, dill pickle, 1 tsp. salt, Worcestershire sauce, and bacon. Set aside. In med sauce pan, melt the butter over med heat. Whisk in all purpose flour and allow mixture to cook for one minute. 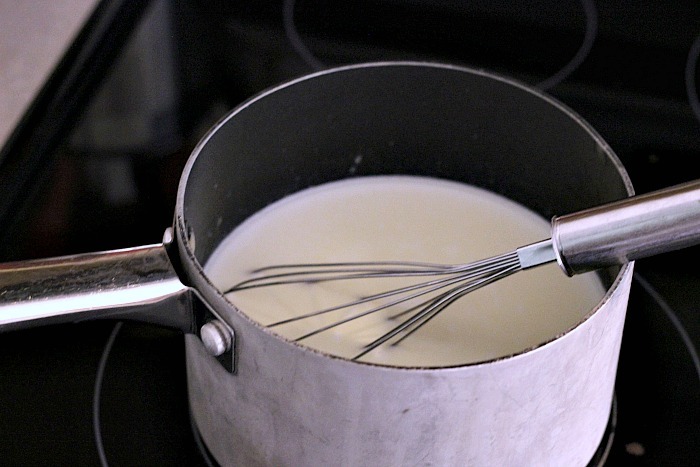 Slowly pour in the milk and allow mixture to come to a boil, stirring constantly. When mixture begins to thicken, take off heat. Add in 1 tsp. salt and 1/4 tsp. black pepper. Spray a 9 x 13" glass baking dish with cooking spray. Drain reserved potatoes and pat dry. Assemble casserole by placing half the potato slices on the bottom of the prepared pan in a mostly single layer. (see photo in blog post) . Sprinkle with additional salt and pepper, if desired. Top potato layer with half of the ground beef mixture. Spread evenly over potatoes. Top ground beef mixture with half the cheese. Pour half the sauce over the cheese, then repeat layers with remaining potatoes, beef mixture, cheese, and sauce. Cover pan with foil. Cook in oven for 40 - 50 minutes, or until the potatoes are soft. Remove the foil and cook for 10 more minutes to slightly brown the top. Allow to sit for 15 minutes before serving. Garnish with shredded lettuce and tomato, if desired. Substitute russet potatoes for the Yukon Gold potatoes, if desired. If you like rustic looking casseroles, leave the potatoes unpeeled. 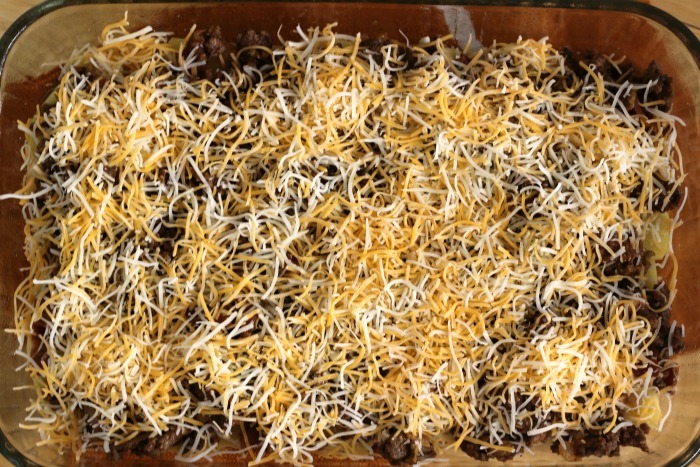 Don't forget to pin Cheeseburger Casserole Recipe for later! Looking for more recipes made with the best Angus beef? Give Marion's Flank Steak Fajitas Recipe or Christie's Loco Moco (Authentic Hawaiian comfort food!) a try. Look for the logo so you know you're buying the best Angus beef! Click here to find markets in your area then follow Certified Angus Beef ® brand social channels for the latest news, chef tips, and recipe inspiration!